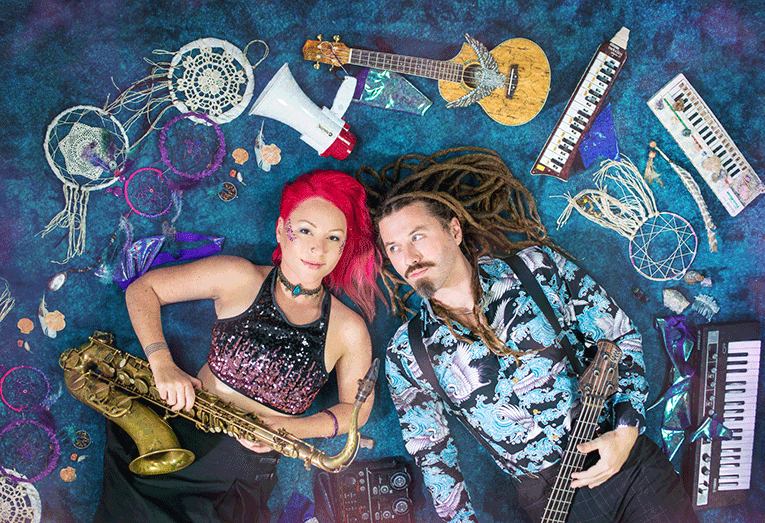 Sky Eater is the sound born of femme musical warrior Chelsea Skyeater & her multi-instrumental artillery (Keys, Uke, Sax, Vocals, Clarinet, Melodica), a loop station, and a lifetime love of music with influences that range from Bob Marley to Bjork. Joined by the SUBlime sounds of TK on Bass, Guitar and Riddims, they bring you all that is Mermaid Trip-Hop Dub. This well travelled pair of highly trained multi-instrumentalists have played music right across the globe with a range of artists at many popular festivals, including: Glastonbury (UK), Rainbow Serpent, Woodford, Island Vibe, Earth Frequency, Kuranda Roots, Bushweek (AU), Luminate (NZ) and Wallaby Creek. After returning from a 6 month tour around Australia Sky Eater have been collaborating on a fresh repertoire, drawing from UK born TKBassDread’s experience in dub, trip hop and drum and bass to further enrich the serene songs and soundscape that Chelsea creates.They currently perform regularly around Byron, Brisbane and the Sunshine Coast whilst preparing to tour Australia, New Zealand, Europe and Canada for the release of their debut EP this summer.